This week only buy two patterns and get two FREE. That right . . . pick out four patterns and pay for only half of them! Offer ends Saturday, February 14 at 5 p.m. Limited to stock on hand. No phone orders. Excludes machine embroidery and clearance patterns. The freebies will be the two that are priced the lowest. No coupon needed . 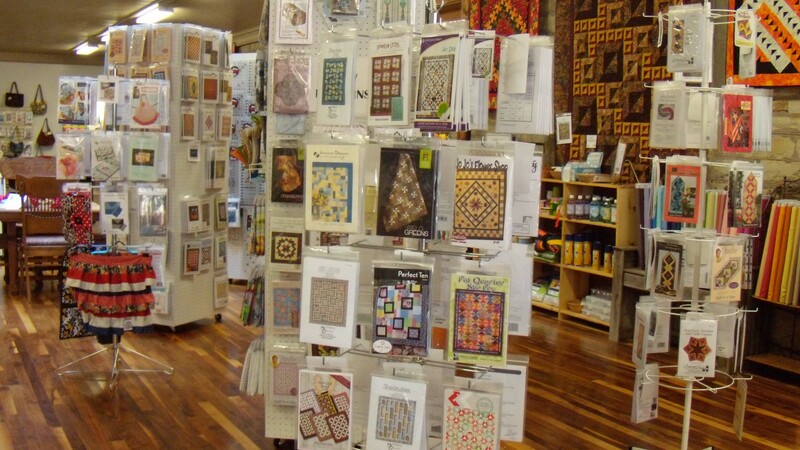 . . just mention that you saw this special offer in the Quiltzette. Look what we did on Sunday . 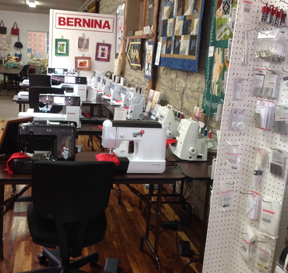 . .
You'll now find our BERNINA department in the main part of the store and baby/kids fabric and kits, minkee, and wide backs in what used to be the sewing machine room. 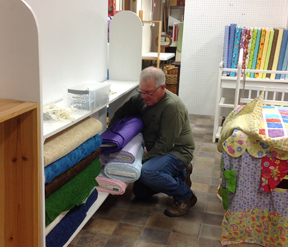 Cindy Dahl and her dear husband Gary along with Karen and her friend Dan worked for several hours on Sunday to transform the store. We love the result and hope you will, too. 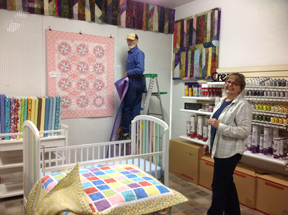 Dan and Cindy decorate the new baby/kids room. Gary wrestles wide backs and minkee. Karen and Cindy . . . almost done! The new sewing machine area is under the window that looks up into The Farm restaurant. 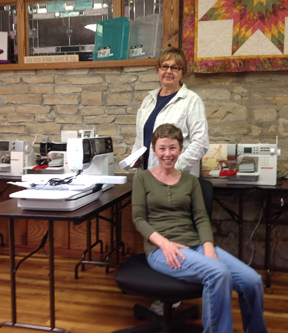 Pop in to test drive a new BERNINA! Third Thursday Demo – February 19, 12:30 p.m. OR 5:15 p.m.
Bring a project and something for dinner and spend an evening sewing with friends. We provide beverages. 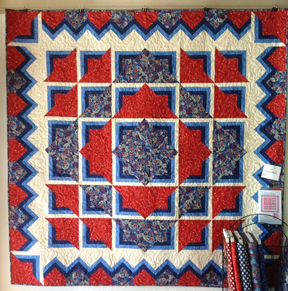 Quilt ‘Til You Wilt is free but limited to twelve people (six minimum) so call 970-565-7541 today to put your name on the list! Discover basic digitizing techniques while we create an embroidery design working only from a poor quality graphic. We will also work with small lettering. We will view a video presentation. If you would like to stay and practice what was demonstrated please bring your laptop loaded with Designer Plus 7. If you don't bring your laptop and want the Design of the Month handouts bring a USB drive. 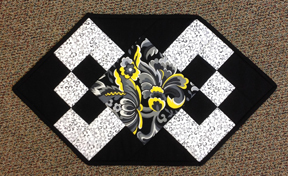 Remember to bring embroidery show and tell projects for more chances to win door prizes! To sign up to attend Software Inspiration this coming Tuesday please call the shop at 970-565-7541 or e-mail cindy@cortezquiltcompany.com. 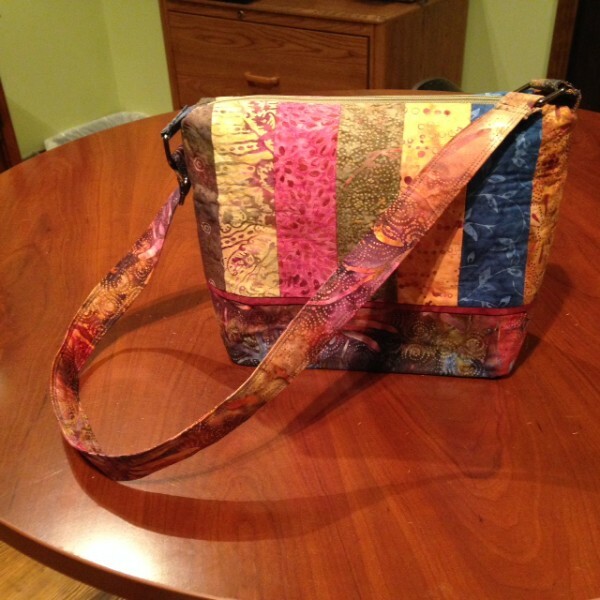 My sister Donna Weaver sent me this picture of the cute bag she made last week. 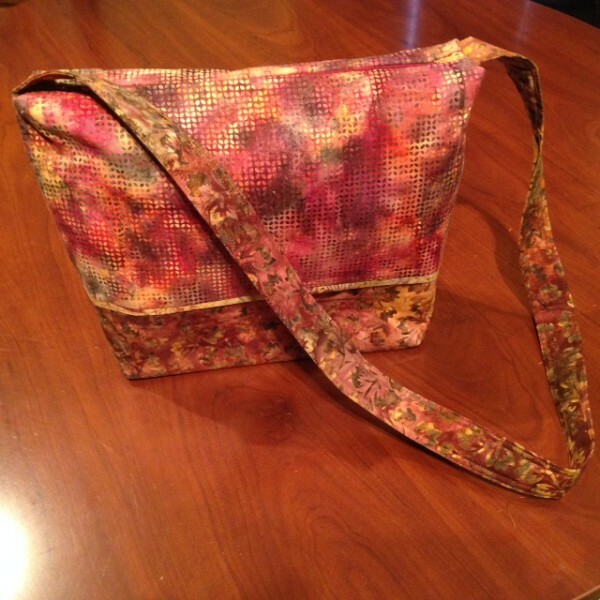 It's the Bermuda Bag from Pink Sand Beach Designs. She bought the pattern when she was here visiting last fall. Donna (never one to follow all the rules) took it upon herself to lengthen the strap, add sliders so the strap is adjustable, and put a zipper in one of the inside pockets. The next day she whipped up another Bermuda Bag and made the inside pockets larger and sewed them in closer to the top opening of the bag. She also used one fabric for the body rather than strips. 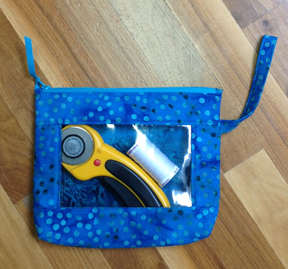 "I suggest making the strap extra long and then testing the length out before actually attaching it to the bag. Another idea is if you have a bag that you like the length of the strap, use it as a guide," said Donna. 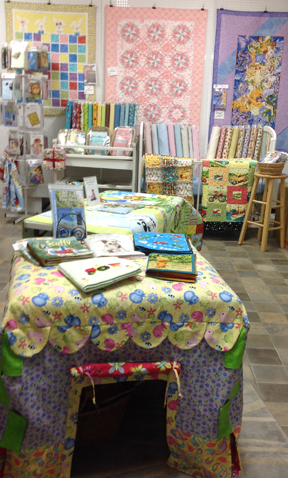 Someone who took Beth's free motion quilting class on Saturday is 3/8 yard shy of what they brought in. If you are missing a yellow piece of fabric please stop by to pick it up. P. S. Many thanks to Beth Cardozo . . . the class was great!